Break up snow and ice dams to prevent leaks from entering your home this summer. With more than half the country climbing, digging, and crawling out of snow and ice, it's important to keep a watchful eye on your home and not just your next footstep! Record freezes have hit us all pretty hard this season. What seemed like a rather short winter for some of us here in the south, has turned into one heck of a spring freeze with rare snow sightings. Some of you more northern based homeowners are probably rolling your eyes right about now. You are wondering what the heck the deal is with the south "shutting down" when Jack Frost barely sneezes on us. The reality is, two inches of snow and ice here in the south might as well be sixteen inches of Canada's finest hard pack winter dust. Simply stated, us southerners just aren't properly experienced or setup to handle ice and snow. Even more so, how to handle everyday life-like driving and traditional winter home maintenance routines. Fortunately, we do not experience an overwhelming amount of snow and ice so we only have to deal with its potential perils maybe once or twice a year. What Are They? 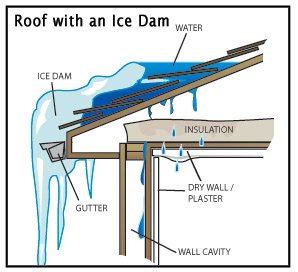 - Ice dams are a build up of snow/ice usually found at the edge of the roof near gutters and the soffit. As the dam forms, water backs up and can create a pool of water on the roof. What causes them? - Snow is less dense than ice and will often times melt sooner. As temperatures rise (inside or outside the home) and the sun comes out, the snow will melt and remain pooled creating a potential for leaks and damaging anything in its path. Ice dams can also be created by heavy snowfall in a short period of time combined with improper ventilation in your attic. Improper ventilation can create warm spots in the attic. The radiant heat can transfer through the roof and melt the existing snowfall. As the snow melts it will run down the shingles until it hits a colder section of the roof like gutters, valleys, or an existing ice dam where it will re-freeze. How do we prevent them? - Cleaning the gutters on your home can help to prevent blockages and ice build up, but will likely not prevent them entirely. 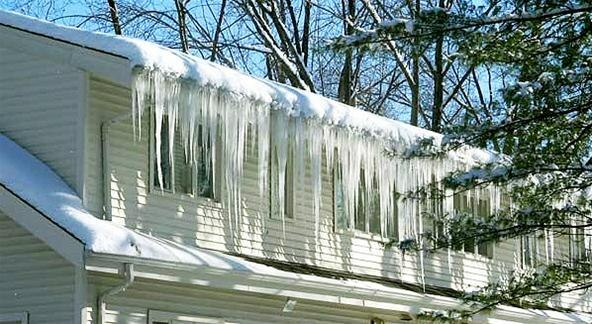 If conditions are right, ice dams can still form on a completely cleared gutter. Thus creating the importance of monitoring your roof closely and removing them before they melt. How do we remove Ice Dams? - This is a big chunk of ice we're talking about here so let's be practical and smart about removing them! Never walk on a snow-covered roof, and be practical about ladder placement when accessing your gutters. Using a roof rake or push broom, sweep the excess snow away from the dam and off the roof. Carefully chip away a channel in the ice dam to allow water flow either off the roof edge, or down into the gutter spout. It is not necessary to remove all of the ice so long as there is an adequate channel for water to flow easily off the roof edge. Future prevention - Properly ventilating your attic space will help to prevent warm spots from forming and prematurely melting ice outside the shingles. The general recommendation for attic ventilation is 1 square foot of vent for every 150 square feet of attic space. This rule of thumb should also be applied for soffit ventilation. With a properly ventilated attic, outside air will flow in from the soffit and exit the attic through the louvers or power vents. 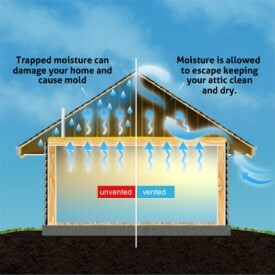 Adequate insulation inside the attic will also help prevent warm spots from forming inside the attic. Insulation values are rated on an R-Value scale which is further explained here. It is generally recommended to have a minimum of 12 inches of attic insulation and not uncommon to find up to 20 inches in new homes. Consistent air flow combined with adequate insulation will help prevent warm spots from forming in the attic, and allow for snow melt in a more uniform manner.